We saw Komolika tonight in Kasautii Zindagii Kay. But hey, weren’t we seeing Komolika for quite sometime now? She wasn’t clearly on our screen like she was tonight, but definitely we saw her hair, hands, back, clothes, and what not in the past few days except her face. And those stares of numerous men who fainted, fell down or went flying after her at public places, gave us more of the hint about how exactly fascinating or rather bewitching Komolika will be! Then the clock got struck at 8 pm and with all the melodious ‘Nikaaaaa’ in the background, walked in Komolika, like a charming queen who demanded all the attention towards herself. With two silent companions on either of her side, Komolika enjoyed the attention she received from men around her and walked with quite an aplomb. 1. Komolika is extremely confident about her appeal to men. She in fact expects every man to be at her feet aas easily as may be butter melts in the heat. 2. Somehow the dialogue, ‘Kaun hai yeh jisne palat kar Komolika ko nahi dekha? Who is he?‘, reminded us of Kareena Kapoor from Kabhi Khushi Kabhi Gham. No, Hina Khan didn’t look, talk or appear as Kareena Kapoor nor is Ekta Kapoor’s Komolika in any way similar to Karan Johar’s Poo, but it’s the same confidence and almost the same words or dialogue shown and spoken by the two characters that strikes you at that moment. Not to forget, Komolika too has two companions by her side to accompany her. 3. After watching Akshara (in Yeh Rishta Kya Kehlata Hai) for 8 years, this avatar of Hina Khan is absolutely captivating. She is looking as enchanting as possible in Komolika’s shoes. 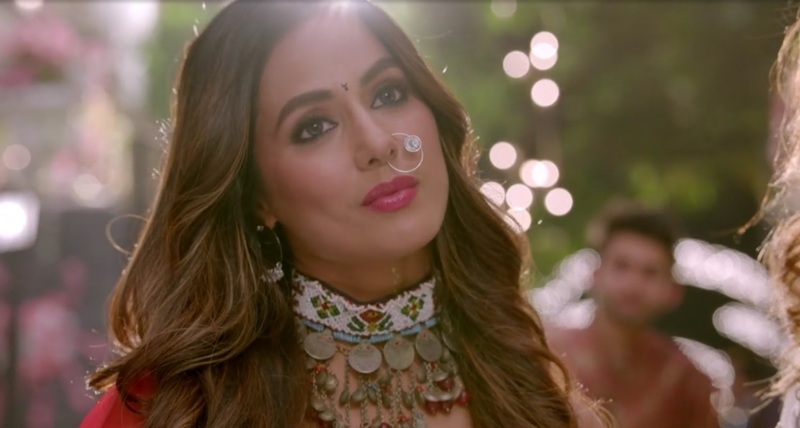 Right from her expressions, her smirk, her glowing eyes in close shots, that cat walk to the way she twirls her hair locks – Hina Khan would transfix your gaze on her every minute action and reaction on screen. 4. Lastly, Komolika is self obsessed and probably has quite an ego, who doesn’t even care to pick up her handkerchief or take it from someone else if the person whom she expected to pick it up had ignored it. And who knows, this ignorance may cost Anurag a lot in his future. Probably, if he had given her some attention tonight, his life would have had less shadow of evil in future. The entry of Hina Khan as Komolika as expected was a bomb! However, the bomb is yet to explode and it will be interesting to watch out for the situation after the explosion. Time To Rejoice! - Ekta Kapoor Confirms Season 2 Of Dil Hi Toh Hai To Exclusively Stream On AltBalaji Soon! I can’t figure out what the men saw in her?? Frankly she looks bad and no one dresses like that in Calcutta!!!! The dialogue was a copy!! !